Like I told some people few days back, sales of old Facebook accounts is becoming a profitable business in some major online forums like Blackhatworld and Nairaland. So many online fraudsters and scammers are on the loose searching for aged Facebook accounts to buy or hack in order to carry out their online scams. If your facebook account is less secured with tips I gave on previous post, then your facebook account will be an easy target to hackers. If you have taking your time to secure your Facebook account with the tips I gave on my previous post, well, congratulations. You are out of the risk of being hacked. This post is actually for those that have got their Facebook account hacked already, and are searching for means to recover their hacked Facebook accounts. So, how do you recover hacked Facebook account? You can see three steps on how to do that below. Note: Once you noticed that your Facebook account has been hacked, no matter the step you choose here to recover the account back; delay can be dangerous. Act fast before the hacker locks you out completely with zero chance of getting the account back. Enter your email or mobile number or username in the text box and hit search. In case you don’t know how and what your Username looks like. It is the unique Facebook identity that you can see in your profile URL. Example: https://www.facebook.com/hunter.9. Here Airdrop.hunter.9 is the username of Airdrop Hunter (a sample Facebook account created to show you what username looks like). Once you have Clicked Search key, you should be able to see your profile with recovery email address and mobile number if any. Select mobile number or email address that you can access right now and then click Continue. You are done. Just create any password and get your account back in few hours. This step involves when the hacker changed your Facebook password and you don’t have access to the email address linked to the Facebook account. Maybe you have lost the login password and phone number used for the email address. Here is what to do to recover the hacked Facebook account. Enter your email or mobile number or username or namein the text box and click search. You will be shown a page with various means of recovering the account back. Below are some of the expected recovery options. Answer Security Question: Though this option is not available for new Facebook accounts but still a viable means of getting your Facebook account back. 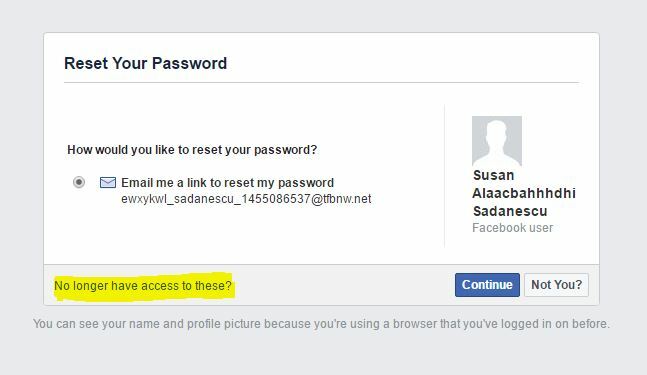 For old Facebook users, you can answer this question to proceed to set a new password if it is listed as one of the extended recovery options. You’ll see a set of instructions that includes a URL. The URL contains a special security code that only your trusted contacts can access. Just call your friends and give them the URL so that they can open the link and give the security code to you. Verify your Date of Birth:You should enter your date of birth to proceed to your Facebook account. Guess your friends using their photos:You need to select 5 friends name out of 7 by seeing their photos. The above steps in recovering your hacked Facebook account works perfectly, depending on the condition of the hacked account at the time of trying to recover it. The condition determines the best step to take in recovering the account. For instance: if the hacker changed only your password, without changing the associated email address (and you still have access to the associated email), STEP ONE is your best bet to get the account back. If the password was changed and the associated email address or phone number remained the same but you don’t have access to the email address again or phone number, STEP TWO will be helpful here. Now, in a situation whereby both the password and the associated email address have been changed by the hacker, all you have to do is follow the guidelines on STEP THREE.